Stakeholder consultation on National Clean Air Programme (NCAP) during 19th -20th April, 2018. Ministry of Environment, Forest and Climate Change has formalized a National Clean Air Program (NCAP) as a long term time bound national level strategy to tackle the increasing air pollution problem across the country in comprehensive manner at total tentative cost of Rs 637 Crore. Air pollution has increasingly been becoming a serious concern, predominantly for health of the people. In order to address the increasing air pollution across the country in a comprehensive manner, Ministry of Environment, Forest and Climate Change has formalized a National Clean Air Program (NCAP) as a long term time bound national level strategy to tackle the increasing air pollution problem across the country in comprehensive manner at total tentative cost of Rs 637 Crore. Overall objective of the NCAP is comprehensive management plan for prevention, control and abatement of air pollution besides augmenting the air quality monitoring network across the country. 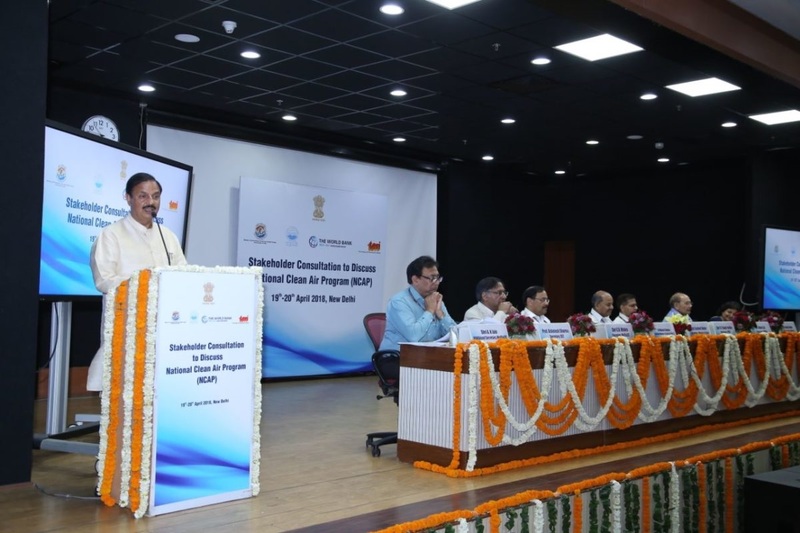 The NCAP focuses on collaborative and participatory approach covering all sources of pollution and coordination between relevant Central Ministries, State Governments, local bodies and other stakeholders. The main components of NCAP include City specific air pollution abatement action plan for 100 polluting cities of the country similar to one for Delhi, under the NCAP, increasing number of monitoring stations, data dissemination, public participation on planning and implementation, setting up of Air Information Centre for data analysis, resource apportionment studies, setting up of national inventory are key components of NCAP, guidelines for Indoor Air Pollution and setting up of Rural Monitoring stations etc. There is Focus on intensive Awareness, Training and Capacity Building Drive with specific impetus on augmentation of manpower and infrastructure facilities of CPCB and SPCB under the capacity building component of NCAP. Separate components with emphasis on three tier mechanism for review of monitoring, assessment and inspection for effective implementation under NCAP. A credible, transparent, and accountable data collection, and monitoring system that is available for timely swift action to be ensured. 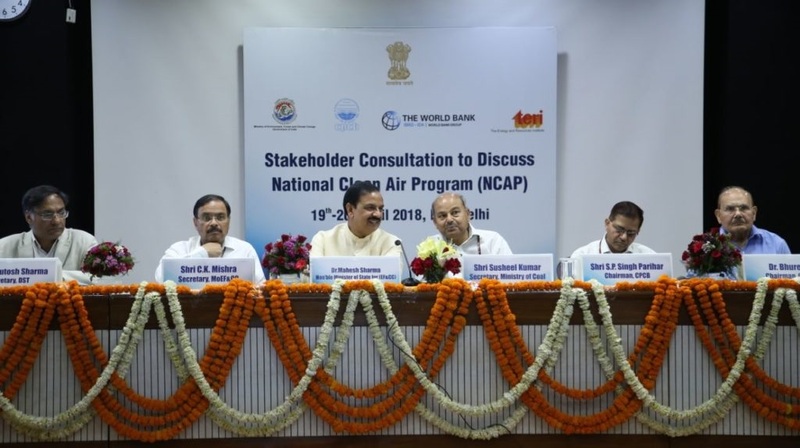 Since air pollution mitigation necessitate collaborative efforts, the success of NCAP is expected to be determined by stakeholder participation and contribution. Accordingly, there is need for consultation with various stakeholders viz. state government, relevant ministries, institutes, academic institutions, industries etc before launching the same. The approved NCAP has already been shared with state governments and uploaded on Ministry’s website for public comments. In this line, stakeholder consultation was held on NCAP during 19th -20th April, 2018 in Ministry of Environment, Forest and Climate Change, involving all the State Governments considering that NCAP is a Pan India Programme and the input from states will be useful in evolving an effective implementation strategy. Agenda for the meeting is enclosed. The Consultation was inaugurated by Dr Mahesh Sharma, Hon’ble Minister of State for Environment Forest and Climate Change and was attended by Shri Shusheel Kumar, Secretary, Ministry of Coal; Prof Ashutosh Sharma Secretary, DST; in addition to Secretary, MoEF&CC and other dignitaries. The State Government officials including officials from SPCBs participated in the consultation. Hon’ble Minister emphasize on the impact of air pollution on health and general well-being of human, floral and faunal population and the role NCAP is expected to play in order to address the increasing air pollution across the country in a comprehensive manner. The NCAP was deliberated in details during the Consultation and inputs from States were compiled.